Over the last two weeks the weather has been hot and windy but that hasn’t slowed the fishing down with some good results coming from the bottom end off the lake with Middling bank, Rushes, Seven Gates being the best place to fly fish, best times have been around 5am to 9am, 6.30pm till 11pm. Middling bank Muddlers, Nymphs, Woolly Buggers and Fuzzy Wuzzys are doing the best. 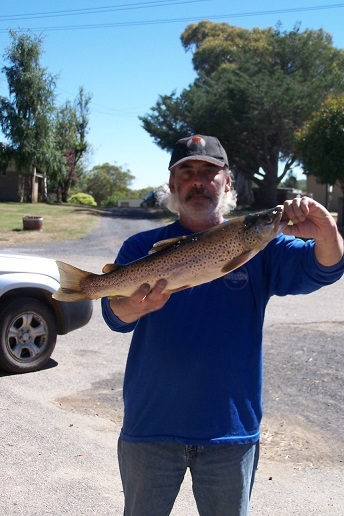 Over at Braemer Bay the fishing is still going well with good reports coming from the dam wall, Jocks Cove, Coppermine Bay, Most fly fishers are fishing late in the afternoon into the dark with good results browns and rainbows. Best flies are Muddlers, woolly Buggers, Mrs Simpsons and Black Nymphs. Overall the fly fishing has been good and it’s about to get better with the mudeye’s and grasshoppers about to start. Peter from Braemar with a fishing report for the period January 30th 2017.
caught every now and then so things are not a total disaster. which is of course good news. no activity which has frustrated anglers. and into the evenings best, so keep that in mind. muddler minnow just on dark.